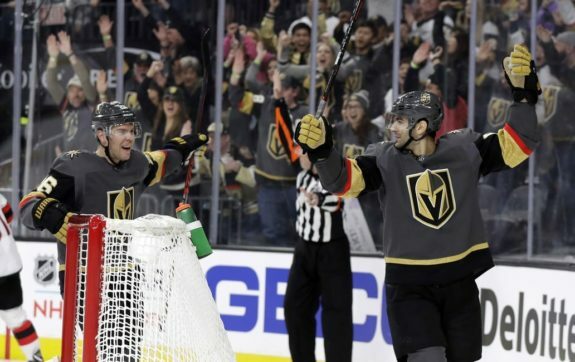 LAS VEGAS — Max Pacioretty broke a tie with 4:14 left in the second period and Malcolm Subban made 36 saves in his first home start since March 30 to help the Vegas Golden Knights beat the New Jersey Devils 3-2 on Sunday. Set up in front of the net, Pacioretty redirected Shea Theodore’s shot from the point past goalie Keith Kincaid. After missing seven games because of a lower-body injury, Pacioretty also had the winner Friday night in his return at Anaheim. Ryan Reaves added his career-high eighth goal, and Brayden McNabb scored his first goal of the season. Vegas overcame a 2-0 deficit to improve to 17-3-3 since Nov. 21. Nico Hischier and Ben Lovejoy scored for New Jersey, and Kincaid made 25 saves. Hischier opened the scoring early in the first period with a one-timer over Subban. Later in the period, Subban was caught in the splits, leaving a wide-open net for Lovejoy. Shortly after Reaves had a goal waved off because the whistle blew before the puck crossed the goal line, the bruising forward got one to trickle through Kincaid’s five-hole. McNabb tied it in the second period with a shot from the point. The goal was initially waved off because of goaltender interference by Ryan Carpenter, but the call was overturned on a coach’s challenge. Both teams were 0 for 2 on the power play, and the Golden Knights are mired in an 0-for-16 slump over their last six games. New Jersey is 25 for 26 on the penalty kill in its last seven games. NOTES: New Jersey star Taylor Hill missed his sixth game and remains day-to-day with a lower-body injury. … The Devils are 5-4-2 in day contests this season. … New Jersey is 27-11-16 in one-goal games. … The Devils, who are an astounding 87-0-14 when leading after two periods since the 2015-15 season, are 2-15-2 when trailing after two periods this season. Golden Knights: Host New York Rangers on Tuesday night.